Published: Aug 28, 2017 · Modified: Apr 12, 2019 · By Jen Sobjack · This post may contain affiliate links. 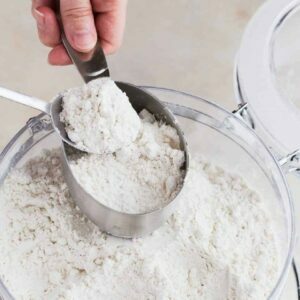 This Homemade Cake Flour recipe needs only two ingredients! You must add to your arsenal of baking necessities. Quite a few recipes on my blog call for cake flour. It’s the best flour to use for a delicate, tender cake with a fine crumb. My basic vanilla cake calls for this flour and if you try to use all-purpose flour, it will give you a denser cake. In fact, the texture will be so dry and dense it will resemble cornbread. But, if you’re anything like me, you don’t always have cake flour on hand. That shouldn’t be a problem though. You make cake flour at home with 2 simple ingredients you already have in the pantry. There are three common types of flour. And they all have different protein content. Let’s take a look. Bread flour has approximately 14-16% protein. This flour is mostly used for making homemade bread and offers the chewiness we all love in rustic crusty bread. All-purpose flour has approximately 10-12% protein. This flour is called for in most baked goods like cookies, brownies, and muffins. It offers a slightly less chewy texture than bread flour. Cake flour as approximately 7-8% protein. The lower protein percentage is crucial for cakes. It’s what gives the cake layers structure along with a light, tender texture. Cake flour is vital for delicate cakes like chiffon cakes. It’s very easy to make your own cake flour. It takes just 10 minutes to prep a whole bunch to store away in the pantry. Gather your supplies. You need cornstarch, all-purpose flour, a sifter, 1 tablespoon-size measuring spoon, and 1 cup size measuring cup. 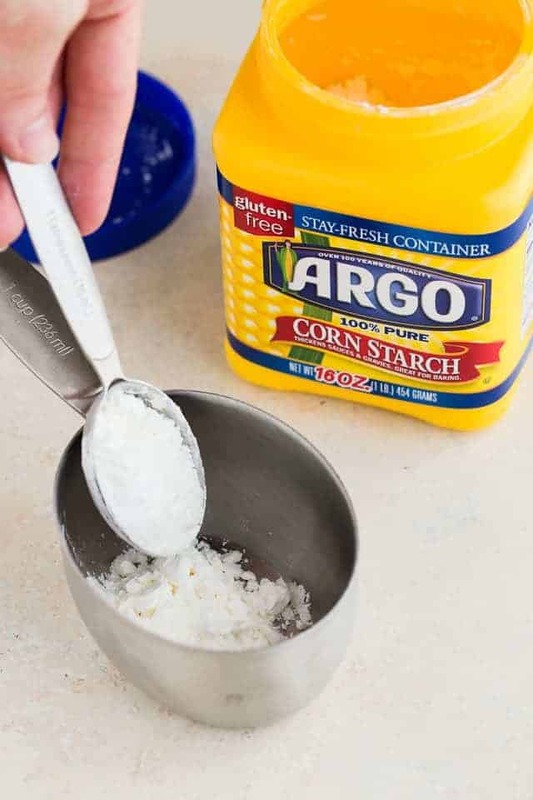 Measure out 2 tablespoons of cornstarch and place it in the measuring cup. Gently spoon all-purpose flour into the cup over the cornstarch. Don’t pack the flour down in the cup. Just lightly spoon it in until the cup will hold no more flour then use the back of a knife to level off the cup. Do this for every cup of cake flour you need for a recipe. 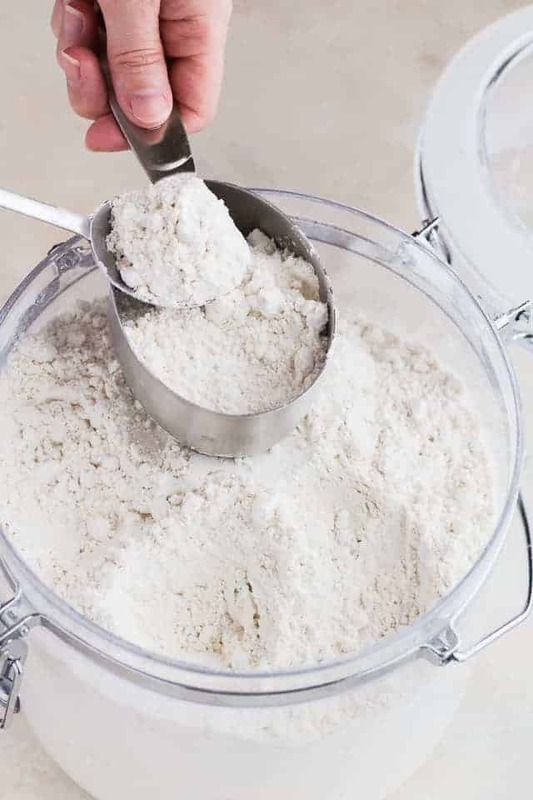 Once you’ve measured out the cornstarch and flour, sift it together 4 to 6 times. Sifting it this many times ensures it’s thoroughly combined and properly aerated. The cornstarch works by inhibiting gluten development to create a soft cake texture. 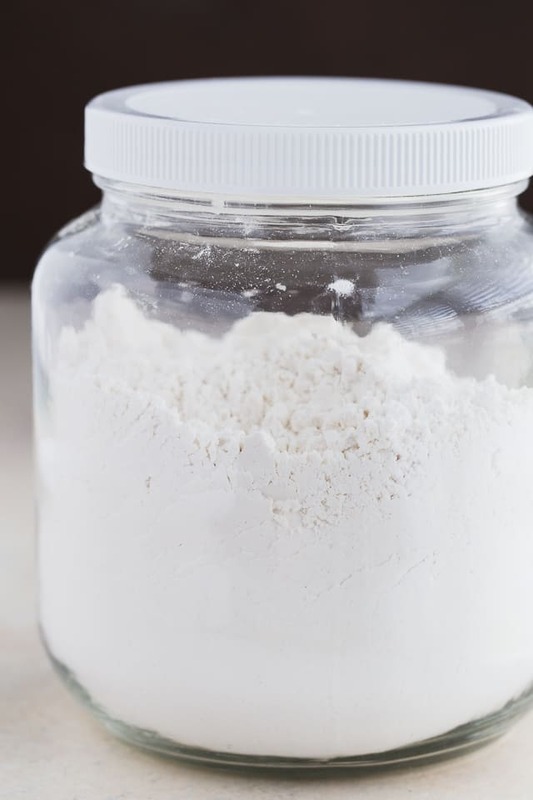 Make several cups of homemade cake flour and store in an airtight container in a cool, dry place. This way you’ll always have it on hand. Read more about Flour Basics and How to Measure Flour in the Baking Basics category. If you are in the UK, cornstarch is referred to as corn flour. Be sure you are not using cornmeal. They are two completely different things. Sift, sift, sift! The flour and cornstarch need to be sifted together well for this homemade recipe to work properly. Sift at least four times but more is better! This recipe is for one cup of cake flour. Multiply the recipe for however many cups of cake flour you need. 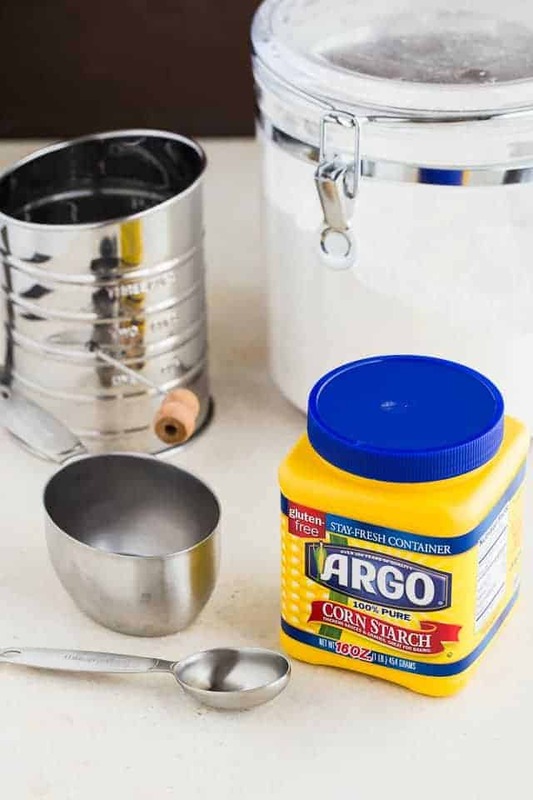 Measure out 2 tablespoons of cornstarch and place it in a 1-cup measuring cup. Gently spoon all-purpose flour into the cup over the cornstarch. Don’t pack the flour down in the cup. Just lightly spoon it in until the cup will hold no more flour then use the back of a knife to level off the cup. Sift the mixture 4-6 times to thoroughly combine and aerate the flour. Repeat for every cup of cake flour called for in a recipe. 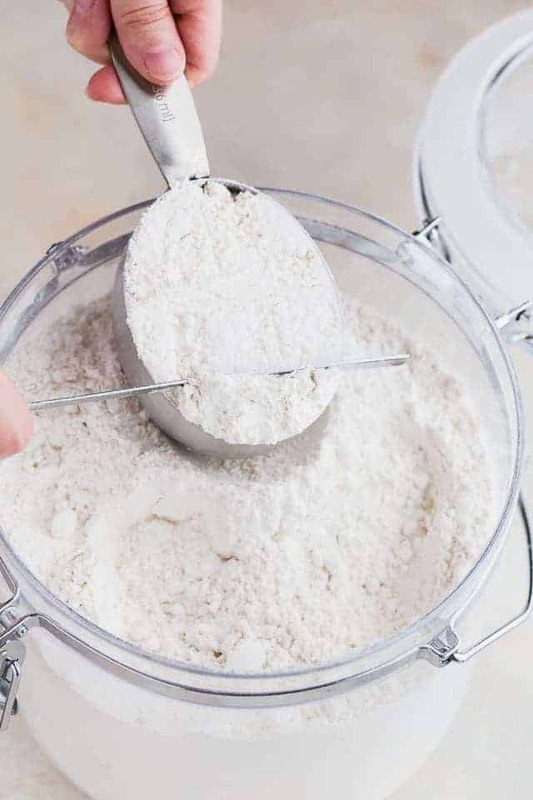 Make a large batch of homemade cake flour to store in your pantry so you always have it on hand! Corn flour is not a substitute for cornstarch. They are two completely different things here in the US. Cornstarch is obtained from the endosperm portion of the kernel and is used as a thickening agent. Corn flour is finely ground cornmeal and it’s used for making bread, tortillas, etc. *If you live in the UK, I believe cornstarch is called corn flour.